Cairo’s iconic Marriott Mena House hotel has earned a spot on Times Magazine’s list of the world’s greatest places to stay in 2018, alongside other stunning spots such as Mexico’s Viceroy Los Cabos hotel and Paris’s Hotel de Crillon. “Hotels often boast of sea or city views, but this one overlooks a Wonder of the World: the Great Pyramid of Giza,” the website says. “In February, Marriott International unveiled a refreshed version of the storied property, which got its start in 1869 as a hunting lodge before being converted into a hotel whose guests included Frank Sinatra and Charlie Chaplin. It now offers 331 suites set amid 40 acres of gardens, as well as four dining areas, a spa, a pool and an 18-hole golf course,” it added. The Times selection is based on nominations from editors, correspondents and industry experts around the world across categories such as museums, parks, restaurants, cruises and hotels. Each were evaluated based on factors like quality, originality, innovation, sustainability and influence. The Mena House was originally built in 1869 for Egyptian Khedive Ismail Pasha, but was sold in 1883 to English couple Frederick and Jessie Head as their private residence. The couple spent their honeymoon in the building, and eventually sold it in 1885 to another English couple, Ethel and Hugh F. Locke King, who converted it into a hotel and opened it the public in 1886 as The Mena House, which they named after King Menes,, the founding father of the First Dynasty. 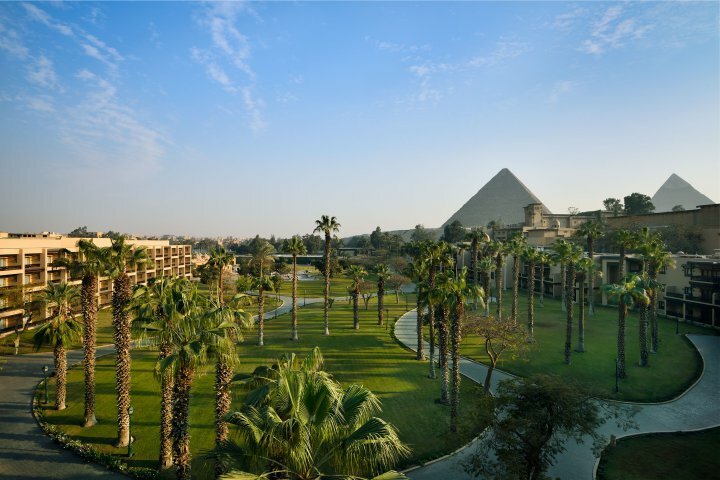 The hotel’s breathtaking view overlooking pyramids and palm trees has attracted several iconic figures over history including Prince Albert Victor of Wales, Sir Arthur Conan Doyle and his wife, King George V and Queen Mary, Sir Winston Churchill and US President Richard Nixon. Other notable people who visited the hotel include mystery author Agatha Christie, actor Sir Roger Moore and film-maker Cecil David Lean. The hotel served Australian troops during both World War I and World War II, who took an interest in it due to its strategic location. Initial talks for the 1977 peace agreement between Egypt and Israel also took place in the hotel.